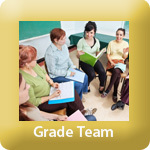 Please check out more about me, teaching, learning and goal setting in our classroom, and how we work as a collaborative grade team by clicking on each of the viewlets below. Thank you for your commitment to working in partnership with me to provide the best possible experience for your child this year! Please read your child's agenda every night, and initial to show that you have read the day's entry. This tool is a great strategy for involving our students in the home/school collaboration process! We want students to bring their agendas to and from school every single day, and to ensure that parents read and sign the agenda and any accompanying paperwork. From time to time, messages from the classroom or school will be sent home via the school agenda in the clear plastic front pocket. Note that forms sent home on BLUE PAPER require parent response, parent signature and immediate return to school. Students are expected to participate in the Herons Crossing School Home Reading and Sight Word Program at least 5 NIGHTS PER WEEK. Parent support is required for this, including reading with your child/listening to your child read, signing off on daily home reading completion and sight word/spelling word work. Thank you for your dedicated efforts in supporting your child's progress as a reader. We truly appreciate it! If your child does not bring home his or her home reading book/duotang or sight words, please use their agenda to locate his or her username and password to Raz Kids or read a book from home with your child. Supporting literacy can happen with any book, magazine, newspaper, or digital technology. We never want a forgotten or missing home reading book or duotang to stop a reader from practicing! We welcome parents in the school and our classroom! Please prearrange any volunteer or visiting time with me prior to coming to class so that we can be prepared for your visit. I want to ensure I can give you the focus and attention that you deserve, whether that means preparing for your volunteer time or answering any questions you may have. During instructional time, my attention centres directly on my students, making the opportunity to converse with parents during class time very limited. Thank you for your adherence to this important request. If you have questions about learning, school happenings or information or class-based activities, the best source of information is the school-created tools, including newsletter, our Google calendar, our school website, class portfolios or direct contact with school staff members. We are here to support families and to provide timely and accurate information. Know that we are only a phone call or email away with the goal of positive, strong home/school collaboration and communication.